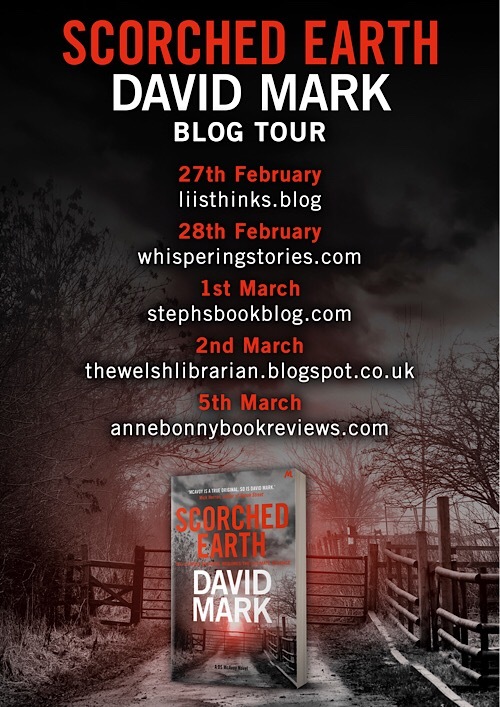 Today I’m delighted to be hosting an extract from Scorched Earth by David Mark. Back cover blurb: A murder and a missing person case puts McAvoy on the track of a man whose desire for revenge is unstoppable - but who may not be the worst criminal involved. Detective McAvoy investigates a murder and a missing person case in this dark and compelling thriller, for fans of Stuart MacBride and Peter May. The police think Crystal Heathers isn't missing. The trainee detective assigned to the case isn't so sure. McAvoy thinks someone was being held at the derelict building where they just found a body pinned to the wall...and that all the signs point to it being a little girl. But why would anyone not report a kidnapping? And how far would someone go to get revenge? The case will test McAvoy to breaking point - as the crimes of the present lead him to a final violent confrontation with an enemy from his own past. This cold is a living thing. It hungers. It hunts. It feeds. When Manu first felt its bitter kiss he feared to look upon his bare arms lest they appear denuded of flesh: chewed to stark white bone. How strange, he had thought. How strange that fire and ice should have the same desires; the same craven lust for meat. Manu is wrapped around himself; his arms blanketing a body as flimsy as the shelter in which he squats, trying to keep his backside above the muddy floor. His eyes are pennies; two perfect circles that stare at the flapping wing of canvas that serves as the doorway of his feeble shelter. Manu shares this patch of scrubland on the outskirts of Calais in northern France with thousands of other men. There is no running water.The ground where he sleeps has the appearance and stench of an open sewer. Most mornings he wakes up semi-submerged. There are times when he has almost drowned himself during one of his midnight hallucinations; plunging nose and mouth into the shallow pool of filthy, fetid water. He blinks. Stops it all. Cleanses himself in the absolute dark- ness behind his eyelids.The scene before him is so desolate that to look upon it for too long is to allow cold water into the soul. The image threatens to saps him of the murderous fury that has propelled him this far. And yet he considers himself fortu- nate. His tent is more luxurious than many. His neighbours protect themselves against the ceaseless rain within a nest of sticks, bin-liners and scavenged pieces of wood. Manu could not say for certain how long ago he arrived here. Weeks certainly. Perhaps months. He has no recollec- tion of his first few days in camp. He knows that the last leg of his journey almost killed him. He has been a passenger on many vehicles during his gruelling passage from his home- land and has long known the dangers of falling from his hiding place to be crushed beneath the great wheels of the wagons on which he stowed away. He has witnessed such gruesome incidents many times. But he had never expected to arrive in Calais as an effigy, a sculpture built of frost. Icy water had splashed up and coated him as he clung to the axle of the last lorry on its journey north.The water had turned to ice upon him; holding him fast, arms outstretched; Christ- like in the freezing dark. Manu has never known the names of his saviours. He remem- bers only the sensation of strong hands as they unpeeled him. There was rain upon his face and a burn upon the back of his leg where his skin had touched hot metal. His shivers were feverish, like the malarial convulsions that shook his sister to her miserable death. But kinder, better men gave him warmth. Treasured sweaters and waterproof coats were bundled up to serve as pillow and blanket. He was fed soups that tasted a little like meat. He was given clothes of his own: a sporty jacket of a flimsy, shiny material; American jeans, canvas shoes. A woollen hat that he could pull down to hide the ugly semicircle of risen flesh where his ear used to sit . . . He did not deserve such kindness. He, who had done such wicked things. But he took it because it was offered and because he had no wish to die. 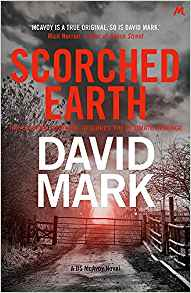 Scorched Earth is available now via Amazon online and all good book shops. Thank You to the publishers who invited me to take part in the blog tour.